Also, a few notes about my book: Wanderlusting are at the bottom of this page. I use a stone called conglomerate for many items. Geologically, it is conglomeration of many small water-worn pebbles, cemented together by nature – nature’s concrete if you will. Because of its particular composition, the conglomerate I find on Prince of Wales Island is full of color. It is in fact the most colorful conglomerate I have seen from anywhere, although some from Brazil comes close. I sometimes call this “Circus Conglomerate” because all the brightly hued circles remind me of a clown’s suit. The first photo below shows a finished table, with Karen's base. The second shows a top. These two tops are from the largest boulder of conglomerate ever sawn -- and, likely, ever to be sawn. Below is a free-form piece, done on commission, in pink marble. The pink color in this marble is extraordinary; a good word might be "delicious." The second photo shows the top of the piece – left natural, it looks like a mountainscape in alpenglow. I like making bowls. The kind of stone I find in Alaska is very complex in both color and pattern. It likes simple designs in which it, more than the artist, does the speaking. Big, rounded vessels are perfect. When I polish the outside, they are "bowls" or "vessels." Meant for within the home, they may bring a bit of nature’s beauty and wonder into the living space, like bringing in a piece of the sunset or a moment of the song of a mockingbird or a tumbling brook. I prefer to leave the edge rough on my bowls. This communicates “stone” and “handmade” to the viewer; that the bowl is not factory produced; that it is not plastic, glass, or ceramic. Done on commission, the bowl below is of Tangerine Marble. The bowl in these two photos is of a very rare type of Aphrodite Marble – I only have a couple of pieces of it. The unusual red patterning in the marble is of a rock type called “breccia.” See the Raw Stone for Sculptors Page, section on Aphrodite Marble, for more information. A customer said: "My girlfriend loves Aphrodite Marble." He asked if we could make a special jewelry stone. "Keep it quiet," he said, "A gift. A surprise." It was a pleasure to make this stone. A small end-table utilizing Golden Aphrodite Marble. The photo does not well show the stone – its warm pastels of pink and gold -- but it does well show Karen’s cool forged steel base, with leaves. A Turtle Birdbath. This is made out of Karheen Conglomerate (not the same conglomerate as shown in photos 1- 3). This particular rock, I thought, looked like a turtle. I added the eye. This is also Karheen conglomerate. A chunk of stone off to one side of the boulder looked like it might have an owl hiding within. I dug it out. The owl perches -- waiting and watching -- from a pile of rocks. It is now in a California garden. A birdbath made out of Prince of Wales Greenstone, aka One Duck Greenstone. This stone, of sedimentary origin, is characterized by its light-and-dark, green banding. 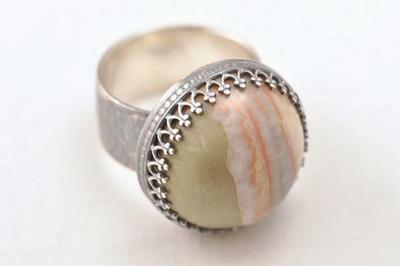 I like to work the stone perpendicular to the banding, which creates rings in the curvature of a bowl. A Jupiter Marble garden sculpture. This is a "minimalist" piece -- not really carved, only polished. Jupiter Marble is an exceptionally colorful marble, with lots of pinks, deep reds, and purples. A published story about the original finding of the Jupiter Marble is on the Raw Stone for Sculptors Page, section on Jupiter marble, of this website. A Jupiter Marble garden sculpture/birdbath. The buyer of this piece also purchased the one above and, previously, three other Jupiter pieces. They are part of the overall composition of her garden. The next piece is pure whimsy. I had a stone consisting of two congenially-joined concretions. Concretions are a rather odd geologic structure – always rounded -- that occur in sedimentary rocks. I saw a giant beetle in this rock, so I gave it some eyes. Karen used scrap rebar to make the legs, antennae, and tail. It is 20” high, 18” wide, and 21” nose to tail. The piece achieves its purpose if its viewer laughs when first seeing it. I sandblast engrave signs and memorial stones. This is a sandblast-engraved plaque, commissioned jointly by the U.S. Forest Service and the Nature Conservancy, to acknowledge a river restoration project. Most of my engraving is of memorial stones (grave stones). I made twelve last year. 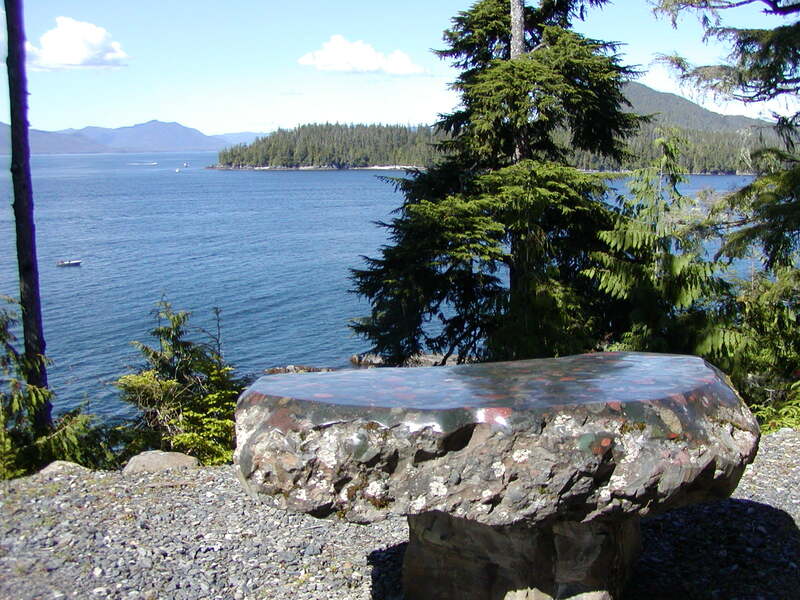 Stone Arts of Alaska’s memorial stones can be found from Dutch Harbor, to Sacramento, to New York City. Most are on Prince of Wales Island. The purchase and placement of these stones can be very important for the families or friends of the deceased – an act of both honor and closure. See Engraved Signs and Memorial Stones page. On a different tack, these are two visually interesting fossils found last summer. Both are polished slabs. The first is a large yellow snail found in Aphrodite marble. Fossil snails (gastropods) are common in Aphrodite Marble but not with this striking color. The second is fossil coral (hexagonaria, Devonian Age) that has a band of brassy-looking pyrite beneath. It is unusual both geologically and visually. 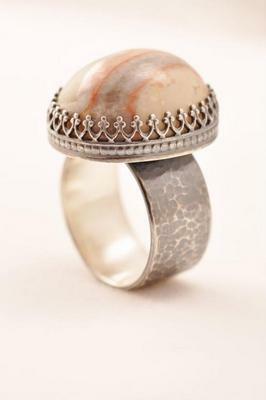 At Stone Arts of Alaska, we love stone almost any way it comes. We love natural stone just as much as stone art. We collect what we call "natural sculpture" -- stones with compelling shapes, colors, or patterns. The Chinese use the term "Viewing Stone" while the Japanese reference "Suiseki." Below are a few stones we added to our collection this year. To view a bigger part of our collection, go to the Natural Sculpture page. Name change: This is a new rendition of the author's previous Hot Coffee and Other Wild Goose Tales. "Wanderlusting is one man's story, alternately funny and hair-raising, about his travels after he dropped out of graduate school in the 1970s. Gary McWilliams chose a working man's life, and worked side by side with an international cast of miners, sailors, and fishermen, crossing paths too with missionaries, smugglers, and revolutionaries. His unusual adventures will keep you turning the pages." Karen Howell. For a signed copy from the author, see Contact Us. “I had a difficult time putting it down. I was chuckling so much that my wife made me read it aloud . . . . This has to be read to be believed—no one could make this stuff up or plan what happened to him. . . .” Kenneth Kupchak, lawyer, Honolulu, Hawaii. “I wanted to read more. . . . totally marvelous, was better than sleeping at night, . . . so well written—I was there.” Verena Swippert, stone sculptor, Arlington, Washington. “Gary McWilliams' book really had me conflicted. I couldn't wait to finish a story, but I didn't want the book to end! I really, really LOVE this book!" Fred Olsen, geologist, Denver, Colorado. “I like the way you weave political and emotional subtexts into the narratives to give them flavor. I was sorry to get to the end.” Charlie Hodges, writer/musician, Tucson, Arizona. "I am blown away by the book. It is great! I have laughed out loud . . . When will it be published? I want a case of them myself." Lois MacKenzie, nurse, Moab, Utah. "All I can say about your book is WOW! WOW! WOW! It has been such a delight to sit for an hour each morning with coffee reading it . . . too intrigued to put it down." Leon White, artist, Seattle, Washington. “I savor it each morning with my first cup of coffee and wonder how to prolong the joy.” Steve Hodges, Powell, Tennessee. "Marvelous, marvelous adventures, told in crackling prose. This is an exhilarating book. Kick back, put a log on the fire, and have at it.” Ernie Crane, teacher, Phoenix, Arizona.